For example, our Cambridge University Press roadbook on „The Science and Practice of Landscape Stewardship“ is currently in production. Two special issues will appear in the course of this year in “Landscape Research” and “Landscape Ecology”. We’ll present our results at a number of conferences (e.g. at the IALE Europe conference in Ghent), and our Knowledge Hub and its HERCULES Labs will be constantly expanded. On the other hand, many of us are bringing the cultural landscapes philosophy and the approaches developed into new projects, networks and other activities. 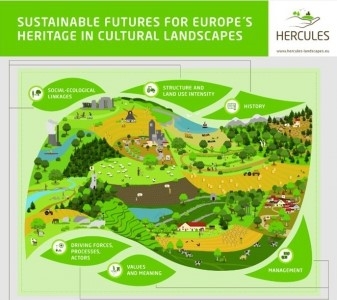 We are also happy to see that the cultural landscapes theme has been taken up in various calls within the EU Horizon 2020 programme. What has our project achieved? · We synthesized the state of the art and defined the way forward for cultural landscape research in six broad research arenas. · We provided the conceptual foundations as well as multiple visions for landscape stewardship, promoting future-oriented, collaborative efforts toward landscape sustainability. · We generated quantitative and qualitative insight into major changes, threats and values of cultural landscapes at pan-European and local scales. · We introduced cultural landscapes as a core theme of sustainability science, for example into the Global Land Programme and the Programme on Ecosystem Change and Society. · We arranged a total of 27 local and European workshops and cultural landscape days, bringing together a broad range of stakeholders and spawning multiple ideas and activities. Within the three years of HERCULES, global policy and the state of the EU have changed at a breath-taking pace – and unfortunately not for the better. Having experienced personally the unique opportunities for exchange and collaboration that the European Union offers to science, I feel that researchers in HERCULES and elsewhere should take up Herman Goossens’ call in “Nature” (read: http://go.nature.com/2lsRH1B) and speak out more loudly about the immense benefits that the European research area – and the European unification project at large – have brought to society. One should think that these benefits are already evident to any reasonable person, but obviously they are not. In HERCULES we know that no cultural landscape on this continent can and should be preserved or developed only locally. Rather, look at how local- and regional-level integrated landscape initiatives across Europe have inspired and cross-fertilized each other, facilitated among others by the European Landscape Convention and the EU Rural Development Programmes. At the same time, integrated landscape initiatives show that both a local/regional and a European identity can be developed around landscapes, without internal contradiction. One does not have to defend those landscape-related developments (e.g., the last CAP reform and the treatment of wood-pastures of high natural and cultural values) in which EU policies sometimes went astray (in many cases driven by the pressure of national governments and their particular interests). But how can we believe that a re-nationalization of land-use or other policies would offer any better solution for the protection, management and planning of landscapes and their natural and cultural heritage? In that regard, I find it comforting that – as Sara Scherr has recently outlined in her blog – revaluing of rural landscapes through collaborative stewardship has great potential to strengthen democratic institutions and civil society, offering “lifeboats for us in a turbulent world”.